With over a century of existence, Chevrolet is one of the better-known automaker brands around the world, with sales exceeding 2 million cars just in the United States. Chevrolet exists as a subsidiary of General Motors. Everything starts on November 3rd, 1911, when Swiss born automotive engineer and race pilot Louis Chevrolet sets the base of Chevrolet Motor Company along William Durant and William Little (founder of the less known Little Automobile). In 1912, the CEO of General Motors Canada, R. S. McLaughlin joins the team. Shortly after he was thrown out of GM’s management team (in 1910), Durant hoped to use Louis Chevrolet’s racing fame to create a new brand. The first Chevy factory is based in Flint, Michigan. It took until 1913 for the first C prototype (Classic Six) to hit the production line, although it was ready on the paper even before Chevrolet company was incorporated. The C series carry the design signature of Etienne Planche, who worked closely with Louis Chevrolet. The 1913 C model was shown to the world at New York’s Auto Show of that year. While it was twice as powerful as Henry Ford’s model T (40hp vs 20hp), it was heavier and the production cost was a staggering $2150, compared to Ford’s T6 ($190) – which was already 3 years old. The origin of Chevrolet’s bowtie emblem is uncertain, as there are multiple sources stating a different inspiration that lead Durant to choose it. However, what’s certain is that the logo was used for the first time in 1914, resting on the Chevrolet H and L series models (Royal Mail, Baby Grand and Light Six, respectively). 1914 is the year when Chevrolet learnt the right lesson and pushed forward the less expensive Little Four ($690), now being able to properly compete against Ford’s T models. Having differences with Durant over design matters, Louis Chevrolet decides to sell his share of the company to his partner. Then, Durant uses the uprising stock value of Chevrolet to buy back a share in GM. As the value of Chevrolet Company rose, in 1916 Durant was able to use owned shares to buy a controlling interest in GM and become company president once again. One of the main profit sources was Chevrolet 490 (2.8-liter inline-4, 24hp) series that can cheap ($690) and quickly established as a big player on the automotive market – it had standard features like headlight dimmer, electric horns and a speedometer. 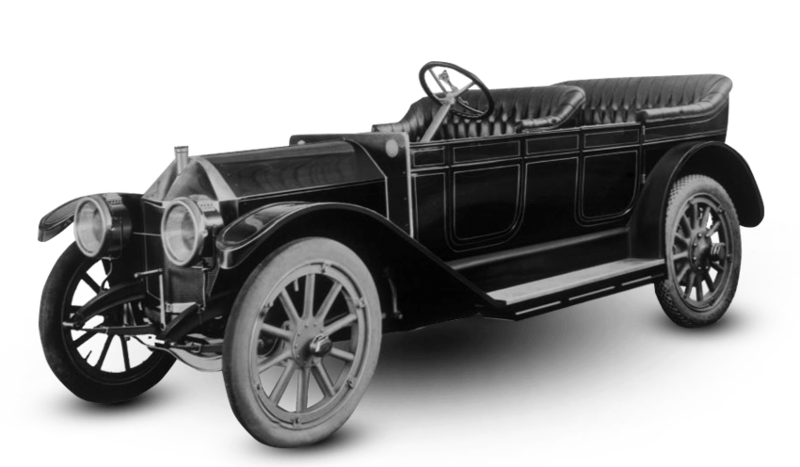 After Chevrolet was introduced as a separate division of GM, in 1918, Series D roadster and touring versions were introduced to the market, featuring the first Chevrolet V8 engine. However, they were taken off production just a year later due to poor sales. Year 1919 shows another bold move by Chevrolet, rebranding and rebadging all GMC commercial grade trucks to use the bowtie. Construction of light duty trucks sharing Chevrolet’s passenger car platform was started and continued through the 1920s, as Chevrolet competed directly against Ford and later on, against Plymouth. Between 1911 and 1920, car sales increased over ten times (173,406 to 1,432,655) with Chevrolet holding an important share of sales. William Durant was ousted a second time from GM, due to poor management decisions. He leaves behind one of the largest automotive corporations to date.